Harmonia axyridis (Pallas) (Coleoptera: Coccinellidae) is a generalist predator native to central and eastern Asia that has been introduced intentionally to several countries in Europe, Africa, North and South America for the biological control of aphids and other insects. 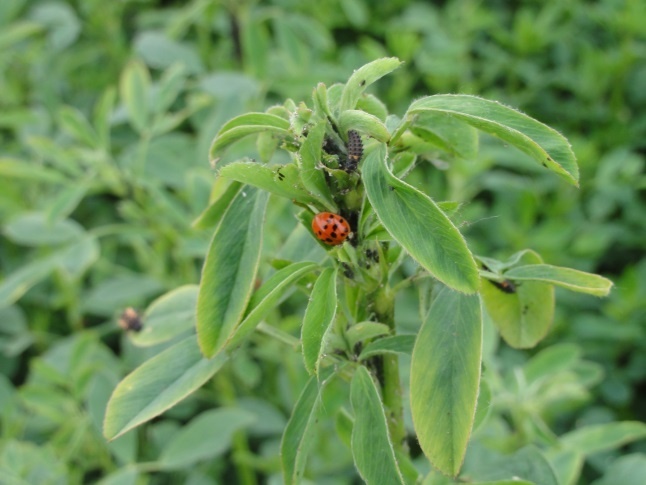 This invasive ladybird has also been introduced unintentionally through transport routes and on produce during international trade. After its introduction, this insect has shown to have the ability to spread rapidly and increase in abundance, becoming a pest. Today it is considered a successful invader and one of the most serious invasive alien species around the globe, being a threat to non-target arthropods (specifically native coccinellids and other insects), affecting fruit production (particularly grapes) and becoming a nuisance to humans while overwintering inside houses. In Chile, the first wild populations were found in 2003 with no subsequent reports until 2008. Since 2008 they have increased significantly in abundance and distribution, but none of the adverse effects described to occur in other latitudes have been studied in Chile. In this project, we will test the hypothesis that H. axyridis is well adapted to the Chilean climatic conditions and a superior competitor and intra guild predator of native coccinellids. Therefore H. axyridis will increase in distribution and abundance, dominating coccinellid communities, generating negative effects in agricultural, rural and urban landscapes. Specifically, we will assess 1) The potential negative effects of H. axyridis on other coccinellid species, including native species; 2) The effects of urbanization on the abundance of H. axyridis and on the composition and structure of the associated coccinellid assemblages; and 3) The spread along the years of H. axyridis in Chile. National Commission for Science & Technology (CONICYT), Government of Chile. FONDECYT 1140662. Coordinators: Audrey A. Grez Villarroel (Departamento de Ciencias Biológicas, Universidade de Chile) and Tania Zaviezo Palacios (Departamento de Fruticultura y Enología, Pontificia Universidad de Chile) and Members: Helen Roy (NERC Centre for Ecology & Hydrology) and Mary M. Gardiner (The Ohio State University).